Follonica: a travel guide to the village of Follonica, hotels, farm holidays, B&B, accomodation, campsites, real estate, beach, sightseeing, photo gallery, top things to see. 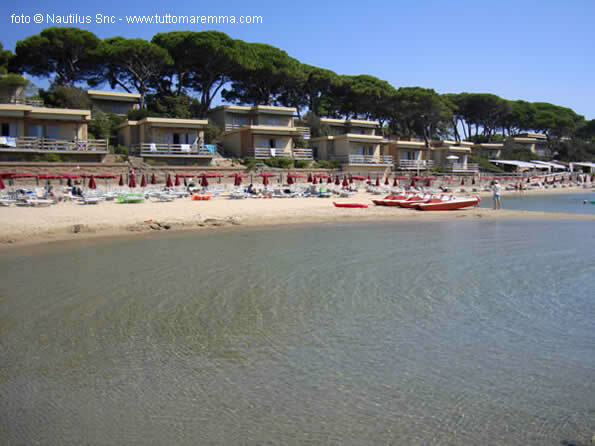 Follonica is a tourist village situated along the golf beach opposite to Elba island and is surrounded by a luxuriant pinewood. There are numerous statements that Follonica receives each year as a mark of the quality of its sea, coast, environment and services in general. It's one of the most preferred family holiday destinations for the quietness of the place and the easy access to the beach, but it's also very popular with young people thanks to its nightlife and summer clubs. Besides the beach, tourists have many alternative trips very close to Follonica such as visits at medieval hamlets, archaeological sites or excursions in Maremma park. As final information, we remind you that in winter Follonica has an important Carnival parade with carnival floats.